Following the advice of Hii-sama Ashitaka travels towards the West. One day he sees a village that is attacked by samurai. When he rides closer to investigate he notices a few villagers who are trying to escape the merciless swords and arrows of the samurai. When one of them is about to be cut down Ashitaka intervenes. The moment he fires his arrow however the markings of the Curse seem to come alive duplicating his strength tenfold and giving his arrow an uncanny power and speed. The arrow hits the sword of the samurai with such a power that both his underarms are ripped off. Two other samurai have observed this and the one with the bow fires an arrow at Ashitaka. He dodges the arrow and fires one of his own. His second arrow decapitates his adversary. The third samurai wisely renounces any further engament and lets Ashitaka disappear into the forest. In the forest he holds his arm under a trickle of water in order to kill the pain and notices that the scars seem to grow. Later in a village he buys some rice from a woman. He pays with a gold nugget which is way too much but the woman doesn't know what it is and tells him she wants some real money. At that moment a monk intervenes and tells the woman that it is gold. He tells her that he would gladly pay for the rice and keep the nugget himself but the woman, finally catching on, takes the nugget back. 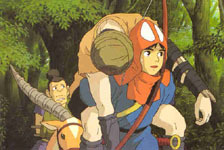 Ashitaka leaves the village, followed by the monk Jiko. As it turns out Jiko was one of the people Ashitaka saved from the samurai. All of a sudden they notice three suspicious men following them. Jiko assumes that they are attracted by the gold that Ashitaka posesses and philosophizes about how easily humans are tempted before he advises that they start running. Later at night, during the meal Jiko thanks Ashitaka for saving his life. He recognizes Ashitaka's bowl as an artifact from a race spoken of in scripture and called Emishi. Ashitaka doesn't react to this and Jiko lets the matter drop. When Ashitaka shows him the bullet Jiko tells him about a forest that bars humans and is protected by ancient gods. It is called the forest of the Shishi Gami. The next moring Ashitaka leaves at dawn and goes in search of this mythical forest. Meanwhile a caravan carrying supplies to Tatara Ba is attacked by the Inu Gami and Mononoke Hime. The Ishibiya Syuu try to protect the caravan with their handcannons. The two sons of Moro, with Mononoke Hime on the back of one of them, cause a diversions and attract the fire of the Ishibiya while Moro attacks the caravan itself from behind throwing both human and pack animal into the ravine. At the head of the caravan, Eboshi Gozen waits until she can get a clear shot at Moro. The moment the Inu Gami is about to attack her she fires her Ishibiya. Moro Is hit but this doesn't stop her. Gonza, one of Eboshi's lieutenants saves both his and Eboshi's life by firing his own ishibiya at the last moment. The ishibiya wasn't charged with a bullet but with gunpowder only creating a massive fountain of fire which deflects Moro and sends her hurling into the ravine. A moment later the attack is over and the caravan is back on its way. A river flows at the bottom of the ravine. Ashitaka who was traveling along its borders notices two of the men that were swept into the ravine by Moro's attack. They are both unconscious and Ashitaka pulls them ashore. One of them, Kouroku is slowly regaining consciousness when Ashitaka hears a strange sound. From the cover of a fallen tree he witnesses a strange appearance. Two big white wolfs appear from the forest at the other side of the river. San is with them. One moment later Moro who had fallen into the river climbs ashore and San starts nursing the wound inflicted by Eboshi's ishibiya. Moro's senses betray his presence and Ashitaka reveals himself. He tells them his name and asks them if they are the Gods of Old who defend the forest of the Shishi Gami. San turns around, looks at him intentively and shouts "LEAVE!" (AUTHOR'S NOTE: The Japanese word San shouts is "Sare!". It can also be translated as "GO!". Since San and her companions return to the forest while Ashitaka remains it is unclear whether the "GO!" was meant for him or for her companions.) 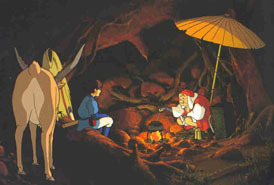 Ashitaka however remains motionless as San, Moro and her two sons disappear into the forest. One of them drags the corpse of one of the pack animals with him. At the same moment Kouroku starts to scream in terror and Ashitaka hurries back. The object of Kouroku's fear turns out to be a Kodama Ashitaka tells him that there's no need to fear a Kodama. On the contrary its appearance signifies that the forest is still pure. Kouroku replies that these creatures call the Shishi Gami and still isn't convinced that the Kodama are totally harmless. Ashitaka puts Kouroku on Yakkuru, takes the other man on his back and starts moving. All around them Kodama appear. They lead the way and after a while start mimicking Ashitaka by taking eachother on the back. Meanwhile Kouroku sits silently on Yakkuru's back. There is still fear in his eyes as he glimpses at the playful Kodama. After a while Ashitaka stops to rest when he notices butterflies that seem to be attracted to something on the ground. He leaves the two men behind and comes closer to investigate. He discovers that the butterflies are attracted by a strange footprint which he cannot identify. When he looks around he sees deep in the forest strange silhouttes against the setting sun. A herd of dears passes through the woods. When Ashitaka look more intently he notices one of them with strange antlers: the Shishi Gami! The same moment the markings of the curse come to live again. Ashitaka can barely control them and puts his arm under water to stop them. After a few moments they return to normal and Ashitaka and the two other resume their journey towards Tatara Ba.